Finance Durham investee, Durham Distillery, to make history founding the region's first Whisky. 2018 has already been a huge year for Durham as the city’s high-profile leisure developments open for business and more than £3 billion of investment is underway across the County, including the transformation of the waterside in Durham City. The latest tenant at the £30m leisure quarter, in the heart of Durham, is Finance Durham investee, Durham Distillery. The company’s new site will house an enlarged production and storage facility, and visitor centre where people can learn about the science of the distilling process and craft behind their making. As part of plans to become a tourist destination, the visitor centre will host a range of informative and interactive tours, showcasing the distillery’s finest drinks by the glass or bottle through public and private events; all with the impressive backdrop of its working distillery. 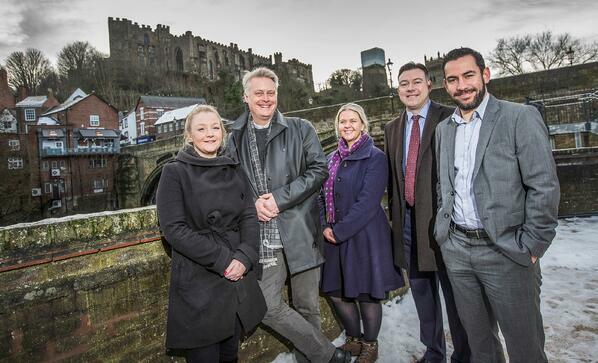 The business secured the Finance Durham Fund’s first investment in September 2017. Twelve months on, Durham Distillery is celebrating an outstanding year, with the investment fuelling the company’s exciting expansion plans, set to create up to 20 jobs over the course of the project. Founded in 2014 by former NHS chief Jon Chadwick, the small-batch craft distillery makes spirits with a 400-litre copper pot still. Durham Distillery is now one of the region’s leading craft distillers producing gin, vodka and gin-based liqueurs sold under the Durham Gin and Durham Vodka brands. Cemented within the roots of Durham, the company’s brand incorporates elements of the city, the logo was inspired by Durham Cathedral’s Medieval Rose Window and colour palette complements the ecclesiastical purple from the Bishop’s vestments. Durham Whisky, the North East’s first ever Whisky, is produced by Head Distiller, Jessica Tomlinson. The first bottles will be available for consumption in 2021, and customers can now pre-order their bottles from the first batch. Using local spring water and malt, Durham Distillery will create a true grain to glass whisky from mashing and fermenting through to a double distillation on two custom built copper pot stills, a 1200L wash still and a 1000L spirit still. Those keen to be part of the company’s latest plans can sign up to reserve a Founder’s Cask from the first whisky run, as well as cases or bottles.